Daewoo Shipbuilding and Marine Engineering (DSME) aggressively rushed into marine plant business since 2011 when marine transportation business went into a recession after global financial crisis, and reported profits of over 400 billion won every year until 2014. DSME, however, announced operating losses of 3.4 trillion won for 2Q of 2015 on August 17, 2015. Most of the losses came from marine plant orders it has won since 2011, and it means considerable portions of their sales and profits in the marine plant business were fabricated. Against K-IFRS 1011 (the applicable accounting standard for construction contracts) which requires periodic reviews of contract revenues and contract costs and immediate recognition of losses when losses are expected, DSME failed to review periodically contract revenues and contract costs of marine plant contracts at issue and delayed the recognition of losses until 2Q of 2015. 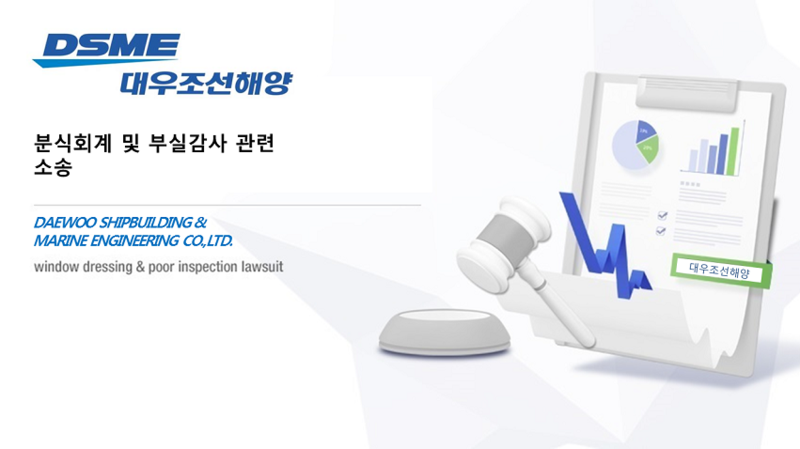 Thus, Hannuri Law, on behalf of DSME shareholders filed a damages suit against DSME and its auditor Anjin accounting because of false disclosure of annual report for 2014 and audit failure, respectively.